"The album was headed for the dumpster when we made a bid for a box, it's contents marked kitchen items. The first time I saw the album I thought it was very special and unique. My father and four of his seven brothers served in WWII. For some time it's been on mind how best to share the album and for the past six months I've emailed WWII Museums with pictures." Mr. Montgomery captured a little reporting when war correspondent Ernie Pyle was killed. "I read this article: COMMAND POST, IE SHIMA, April 18 1945 (AP) — Ernie Pyle, war correspondent beloved by his co-workers, GIs and generals alike, was killed by a Japanese machine-gun bullet through his left temple this morning. On April 16, the Army's 77th Infantry Division landed on Ie Shima, a small island off Okinawa, to capture an airfield. Although a sideshow to the main battle, it was "warfare in its worst form," photographer Roberts wrote later. "Not one Japanese soldier surrendered, he killed until he was killed." On the third morning, a jeep carrying Pyle and three officers came under fire from a hidden machine gun. All scrambled for cover in roadside ditches, but when Pyle raised his head, a .30 caliber bullet caught him in the left temple, killing him instantly. 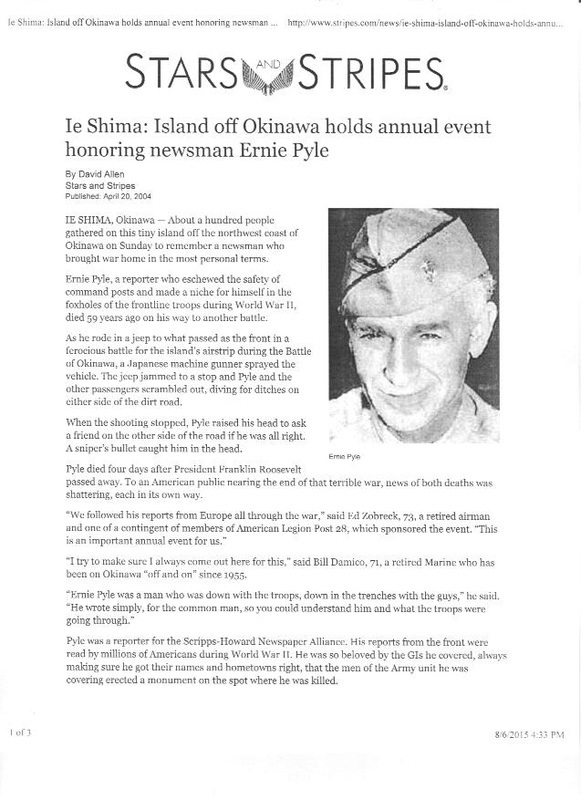 Pyle was first buried among soldiers on Ie Shima. In 1949 his body was moved to the National Memorial Cemetery of the Pacific at Punchbowl Crater, near Honolulu. 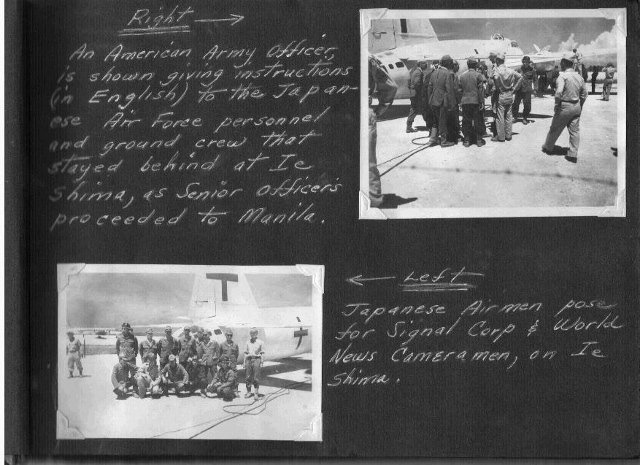 Pictures and words are by Marine Harold Montgomery, a black man and Battalion Head-Quarters file clerk with the 1873 Engineer Aviation Battalion on Ie Shima. "I was a member of the 1873rd Aviation Engineer's stationed on Ie Shima at the time of the history making event". The 1873rd Engineer’s Aviation Battalion helped construct the air strip on Ie Shima. Mr. Montgomery it seems lived at 26910 Yale, Inkster, Michigan. There's a picture of him on page 10 sitting on the wing of a P-51 fighter plane. A proud American serving his country for freedom. Below are notes clipped to the last page of the album to share his experience with others. April 16, 1945, 70 years ago the U.S. Army's 77th Infantry Division landed on Ie Shima, a small island off Okinawa, to capture an airfield. When the Japanese had been defeated they were instructed to fly their peace Delegation to Ie Shima in planes painted white with green crosses. Two white crosses were also painted on the run way. There the Japanese would be flown to sign surrender terms Sept.2, 1945. The representative will be accompanied by competent advisers representing the Japanese Army, the Japanese Navy, and Japanese Air Forces. 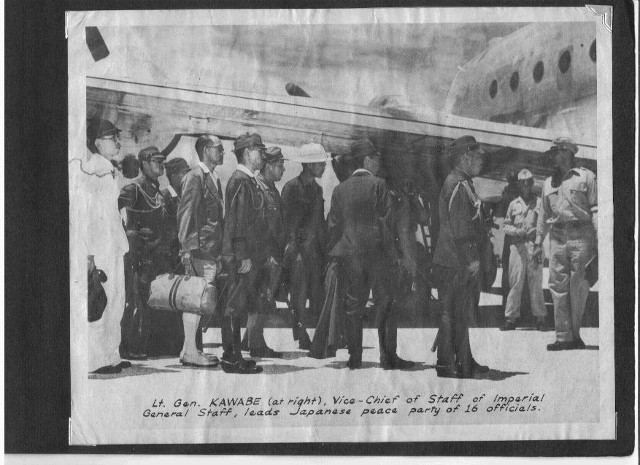 Procedure for transport of the above party under safe-conduct is prescribed as follows: The party will travel in a Japanese airplane to an airdrome on the island of Ie Shima, from which point they will be transported to Manila, Philippine Islands, in a United States airplane. They will be returned to Japan in the same manner. The party will employ an unarmed airplane, type Zero, model 22, L2, D3. Such airplane will be painted all white and will bear upon the side of its fuselage and the top and bottom of each wing green crosses easily recognizable at 500 yards. The airplane will be capable of in-flight voice communications, in English, on a frequency of 6,970 kilocycles. 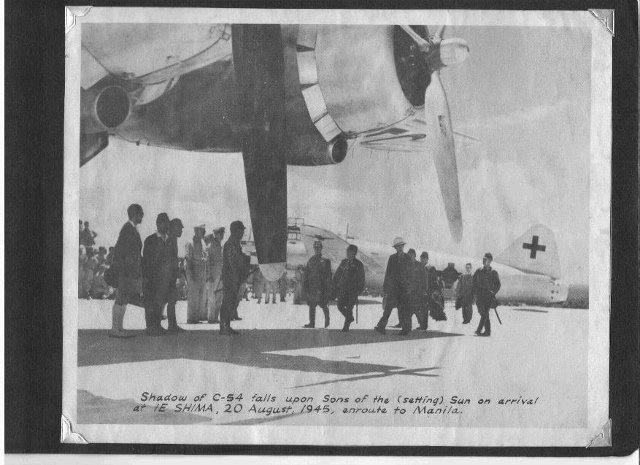 The flight of these two Betty's became known as the Green Cross flights and the technique became the standard operating procedure for Japanese aircraft carrying envoys for surrender across the remnants of the Japanese empire for the next month. The only Japanese aircraft flying unmolested had to be approved and had to cover their old markings with the approved Green Cross standards. Not every aircraft complied with every detail of the specified paint scheme; not every aircraft was painted white nor every cross painted green, but scores of these surrender aircraft brought about the end of the killing and suffering and the beginning of the healing. On Sunday, September 2, more than 250 Allied warships lay at anchor in Tokyo Bay. The flags of the United States, Britain, the Soviet Union, and China fluttered above the deck of the Missouri. Just after 9 a.m. Tokyo time, Japanese Foreign Minister Mamoru Shigemitsu signed on behalf of the Japanese government. General Yoshijiro Umezu then signed for the Japanese armed forces, and his aides wept as he made his signature. Green Cross flight to Ie Shima.